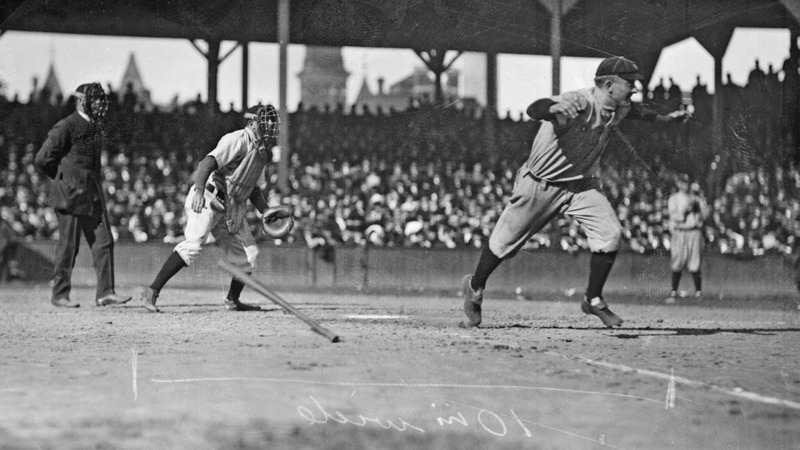 A year made little difference, as the 1908 Series was simply a rematch of the '07 Fall Classic. The big stories came before the World Series, as the Cubs and Tigers both captured their pennants on the very last day of the regular season. In Detroit for Game 1, the Cubs trailed 6-5 as they came to bat in the ninth. Tigers knuckleballer "Kickapoo" Eddie Summers had been pitching well in relief to that point, but the Cubs strung together six straight hits and five runs against Summers for a 10-6 triumph. The clubs traveled to Chicago for Game 2, which remained scoreless after seven innings. But just as they'd done in the ninth inning of Game 1, the Cubs exploded again, this time for six runs in the eighth. Shortstop Joe Tinker got things started with a two-run homer, and Orval Overall cruised to a 6-1 victory. The Tigers finally got on the board in Game 3, George Mullin taking credit for an 8-3 decision, Ty Cobb going 4-for-5 with a double and two RBIs. Back in Detroit, Cubs ace Mordecai "Three Finger" Brown -- 29-9 during the regular season -- baffled the Tigers, allowing four hits and zero runs. Summers was no match for Brown, as the Cubs won 3-0. And it was more of the same in Game 5, with Overall performing shutout duties this time. The Cubs scored one in the first inning and one in the fifth. Overall did the rest, and Chicago clinched their second straight World Series Championship with a 2-0 win.